CB has been making a vegetarian version of this dish for years and I’ve always approached it with a reluctant enjoyment. The truth is, I have an inherent suspicion of vegetarian curries where I intellectually know I shouldn’t. This is why I end up making lots of dishes that could be vegetarian very, very meaty. I’m working on this. 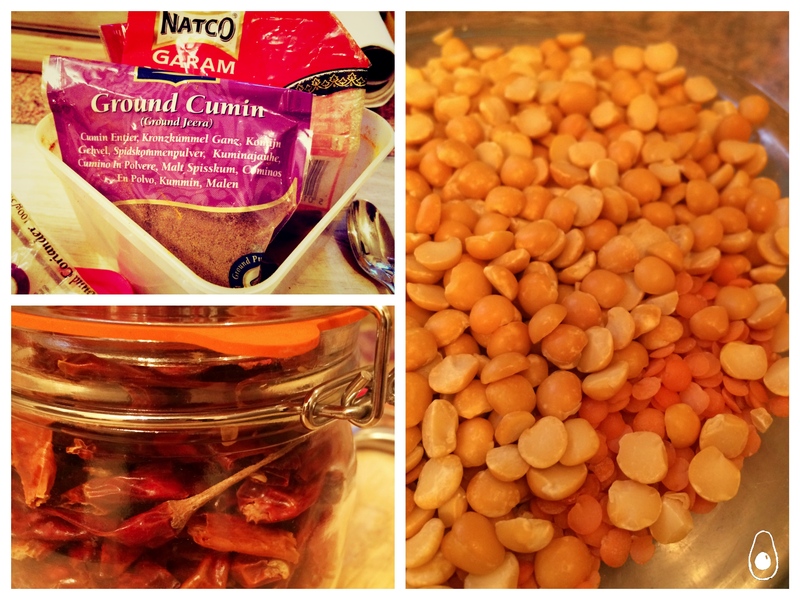 In the meantime, CB suggests that we perfect and post the Tarka Dhal recipe. “With chicken?” I ask hopefully. She gives me a very stern looks which tells me I have some ways to go. We used dried kashmiri chillies which are quite mild and subtly smokey, so we threw in about 6 and got a nice warming heat at the back of the mouth. Depending on the chillies you’ve got and the dhal you want, you’ll have to adjust your chilli consumption. Generally speaking, fresh finger chillies should be used sparingly but will infuse the curry with a lovely bite (chop off the stalk and add to the tarka). Have some extra lemon and garam masala on hand to adjust the seasoning towards the end. The addition of chicken here is totally optional so the dish is completely suitable for veggies. The dish is the ideal comfort food: warm, filling, healthy and easy. You’ll forget all about creamy curries (maybe, sort of ) once you get through this – the lentils and fresh tomatoes keep it nice and thick without packing on the calories. If you do want something a bit extra on the side, I serve this with a generous dollop each of natural yoghurt and mango chutney. Eat while on the sofa in your pyjamas. Robustly fend off any attempts made on your portion. Adapted from this recipe by Anjum Anand. Rinse the lentils and place them in about a litre of water in a saucepan. Bring them to the boil – some residue might form on the top, just skim this off – and add the turmeric, garlic, ginger and a little salt. Bring the heat to an energetic simmer (but not quite a boil) and cover the pot. Leave for at least 40 minutes or until cooked, stirring occasionally. After the lentils have been cooking for about 30 minutes, heat the oil and butter/margarine for the tarka (if using brown rice, put this on now). 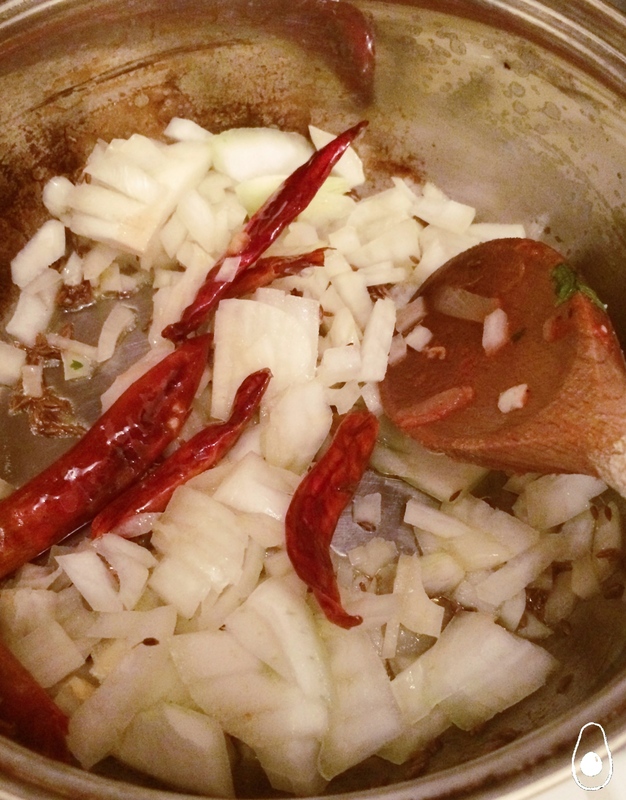 Add the whole dried chillies and cumin seeds and, once they have browned (about five minutes) add the onion and continue to fry until well browned – another ten minutes. Add the tomatoes, garam masala and some salt and fry until very fragrant, around 10 minutes. Add this mixture into the pot with the lentils which should at this point, be quite tender and thick. While the tarka with tomatoes is set aside to cook for 10 minutes, season and cook your chicken. Don’t be too shy with the curry powder – it will make your chicken taste like it’s been cooked in the curry and extremely moreish. Either fry or grill on a high heat until browned and crisp on the outside but not cooked on the inside. Cut/shred as best you can and set aside. Add the chicken pieces and cook for another 10 minutes, mashing some of the lentils on the side of the pan. Add a little water if the lentils are too thick (remember it will thicken further as it cools). Add the lemon juice and coriander, adjust the seasoning (I usually add more garam masala at this point) and serve.Taking this one happily over to Fiesta Friday! This looks and sounds fabulous – I am sure that shredded chicken would be lovely in it too but I am loving CB’s attempts to keep it real!! Thank you for bringing this to the party – Happy Fiesta Friday! !